Slowpoke in game: 6,533 Who? Important notice! Pokemon Slowpoke is a fictional character of humans. Slowpoke is a pink creature that resembles a cross between a salamander and a hippopotamus. Its vacant eyes never seem focused, and it has curled ears and a rounded, tan muzzle. It has four legs, each of which ends in a single white claw. Its long, tapering tail has a white tip. This tail drips a sweet, sappy substance that is attractive to many species of fish. Slowpoke uses it as a lure for fishing, and it will grow back if cut off. In Alola, its tail is often dried and used in home cooked stews. Slowpoke's first appearance was a brief one in Island of the Giant Pokémon. Ash's Pokémon asked it for help, but it didn't respond. It evolved into a Slowbro at the very end of the episode. 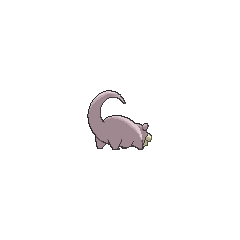 Slowpoke was seen in The Evolution Solution. Ash and his friends asked for the help of Professor Westwood V to help figure out why Slowpoke only evolved into Slowbro when a Shellder clamped on its tail (a question that was giving Professor Oak a headache). Westwood's Slowpoke evolved when a Shellder that Jessie caught clamped on to the Dopey Pokémon's tail. A Shadow of a Drought revealed that Azalea Town considers Slowpoke sacred due to legends claiming that Slowpoke's yawning can summon rain. Enlighten Up! introduced practitioners of a religion similar to Buddhism that see Slowpoke's empty head as a sign of enlightenment and worship by meditating along with Slowpoke and Slowbro. Slowpoke also appeared in Primeape Goes Bananas, the banned episode EP035 and Clefairy Tales. A Slowpoke appeared in Mewtwo Strikes Back. Multiple Slowpoke were among the Pokémon seen at Professor Oak's Laboratory in Showdown at the Po-ké Corral. 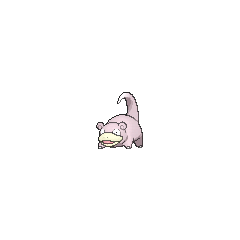 Multiple Slowpoke also appeared in The Power of One. Two Slowpoke were part of an exhibition in Flower Power. A Slowpoke was one of the Pokémon seen at the Pokémon Swap Meet in Tricks of the Trade. 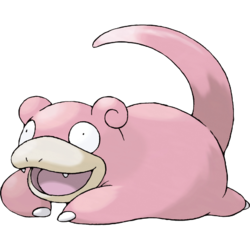 A Slowpoke was one of the Pokémon living in Len Town in The Psychic Sidekicks!. A Trainer used a Slowpoke in Hook, Line, and Stinker to aid him in the annual Seaking Catching Competition. A Slowpoke appeared in Beauty and the Breeder where it participated in a Pokémon breeding competition. A Slowpoke appeared in Dueling Heroes. A Slowpoke appeared in the opening of Destiny Deoxys and Lucario and the Mystery of Mew. A Slowpoke made an appearance in Best Wishes Until We Meet Again! 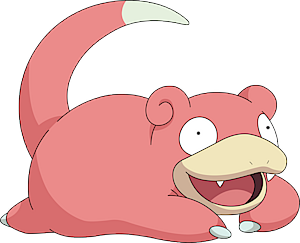 along with its evolution form, Slowbro. A Slowpoke appeared in SM005. A Trainer's Slowpoke appeared in SM006. EP066 Slowpoke Ash's Pokédex Slowpoke, the Dopey Pokémon. No one can tell when a Slowpoke is thinking, if it ever does think. Its specialty is fishing with its tail. EP244 Slowpoke Ash's Pokédex Slowpoke, the Dopey Pokémon. Slowpoke is always lost in thought though no one knows what it is pondering. 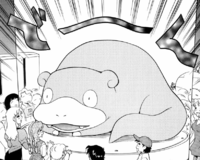 Slowpoke debuts in Wake Up—You’re Snorlax! owned by a Swimmer who partook of the bike race along Route 11. Slowpoke appeared in Sigh for Psyduck as corpses used by Koga's Gastly. In A Flaaffy Kerfuffle a Slowpoke appeared where it was one of the Pokémon in Professor Oak's fantasy when he explains that Trainers should only have six Pokémon with them. Later a Slowpoke was one of the Pokémon sent to help the fight in Ilex Forest in The Last Battle XIII. The current artist, Satoshi Yamamoto, used a Slowpoke in Volume 11 as a self-portrait. Slowpoke is a Pokéfloat. It initially has its tail curled towards its body but the tail lazily becomes straight and fighting moves there until Wooper appears. However, Dodrio has this trait when its weight is measured in kilograms. 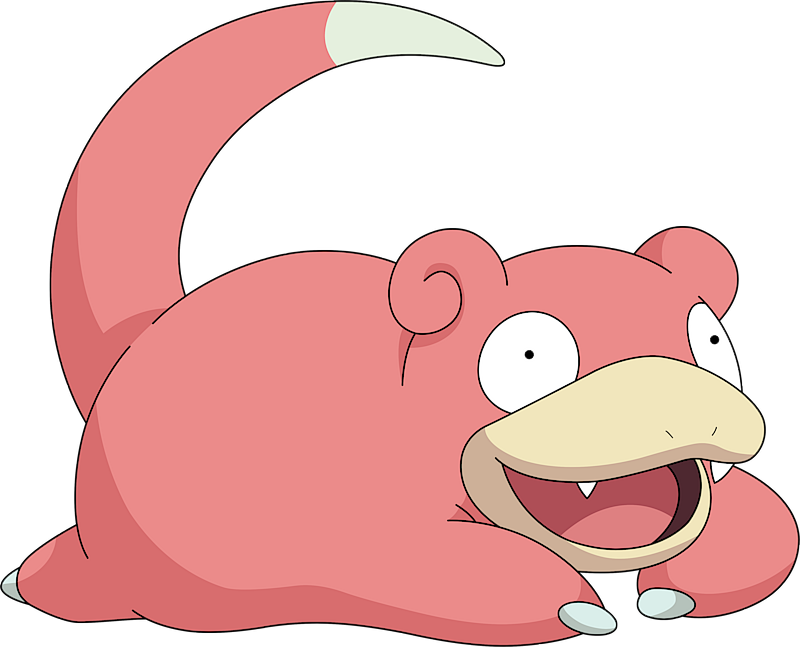 Slowpoke is the slowest Psychic-type Pokémon.